Beach napkins and placemats are perfect table decorations for your beach wedding or beach themed event. They are also great for pool parties. 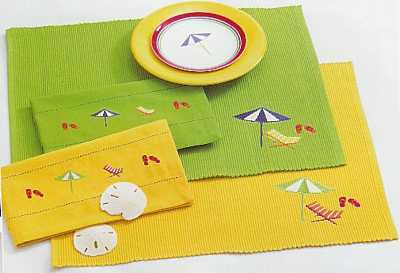 The beach napkins and beach placemats are brightly colored and uniquely decorated to give your event that added touch that you have been looking for. 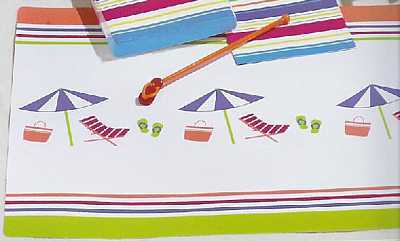 What can be better than beach napkins and beach placemats. Looking for a truely unique gift? Personalized floor mats will be that gift. There are so many options to make these floor mats perfect for anyone, including yourself. Just choose your carpet color, binding color, font style and font color! You have created a unique gift. Please allow 2-3 weeks for processing. Prices start at $40. Price is per set of custom floor mats. Also note that there may be shade variations from the pictures on the site. Please call for custom sizes. Please add your personalization in the comment field below. If you want a monogram, please put the letters in the order that they will be embroidered. Click here to see mat shapes, carpet colors, border (binding) colors, monogram styles, font styles, font colors. Looking for a truely unique gift? 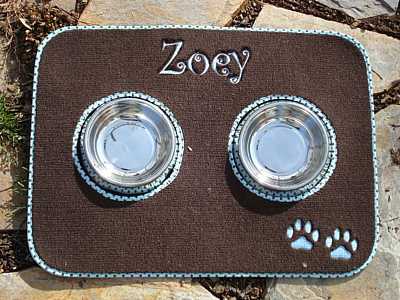 Personalized pet diners will be that gift. There are so many options to make these pet diners perfect for any animal lover. Just choose your carpet color, binding color, font style and font color! You have created a unique gift. Please allow 2-3 weeks for processing. Prices start at $19. Price is per custom pet mat. Price includes bowls. Bone shape does not include bowls. Also note that there may be shade variations from the pictures on the site. Please call for custom sizes. Please add your personalization in the comment field below. 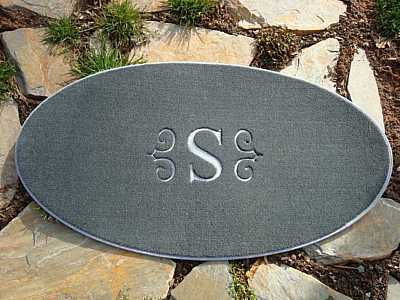 Click here to see mat shapes, carpet colors, border (binding) colors, monogram styles, font styles, font colors. Choose Pet Diner Size bone shaped 64oz 18"x30" (add $26) 32 oz 18"x27" (add $11) 16 oz 18"x24" (add $5.40) 8 oz 12"x20"
The beach colored napkins are great for beach weddings or pool parties. The beach colored cloth napkins are 100% cotton, machine washable, tumble dry. ~20"square Price is per beach colored napkins. Must order in increments of 4. The beach napkins are 3 ply paper napkins that are printed with a waterbased non-toxic ink. The beach napkins are 20 per pack. They are brightly colored and would be a great addition to your beach event or pool party. 9.875" square. Don't forget to order to flip flop swizzle sticks! They are really cute. The beach vinyl placemats will be a big splash at your beach wedding. Give the beach vinyl placemats as gifts or use them as part of your table decoration. They are sponge backed. Price is per placemat. Must order in increments of 4. These shaped flip flop coir mats are great additions to beach weddings or bridal showers. If you are having a flip flop themed event, these are a must have! Bleached coir. Shake or brush clean. 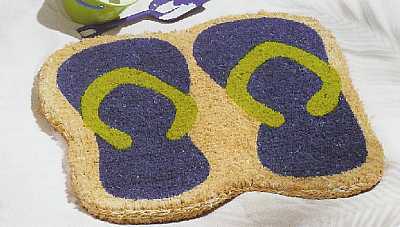 The flip flop mats are best maintained under protected area. 20"x20" Great for beach themed events. 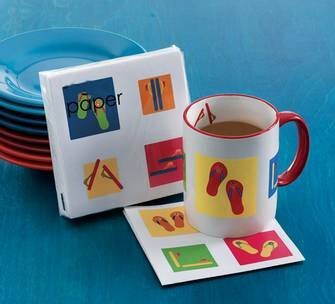 The flip flop napkins are 3 ply paper napkins that are printed with a waterbased non-toxic ink. The beach napkins are 20 per pack. They are brightly colored and would be a great addition to your beach event or pool party. 9.875" square. 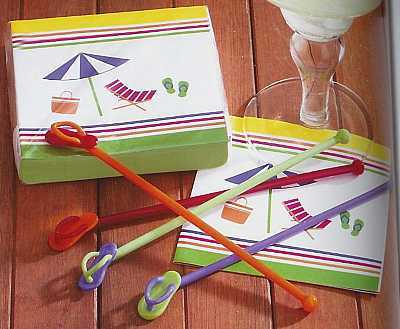 Don't forget to order to flip flop swizzle sticks! They are really cute.